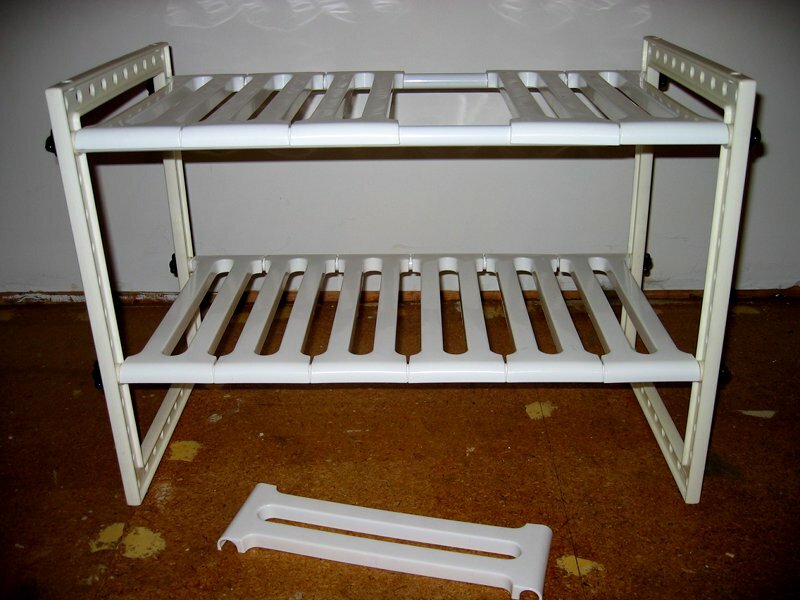 Nimue acquired this clever under-sink shelves kit while we rented a house with very limited kitchen storage. Its modular design allows one to assemble it to fit in whatever space available, including around plumbing. I admire it extremely. But we don’t need it at Casa de WIST, and we’re not going to store it against the chance we might wish we had it again someday. We’ll try to sell it on craigslist. Comments welcome … or we could just shelve it and call it a night! 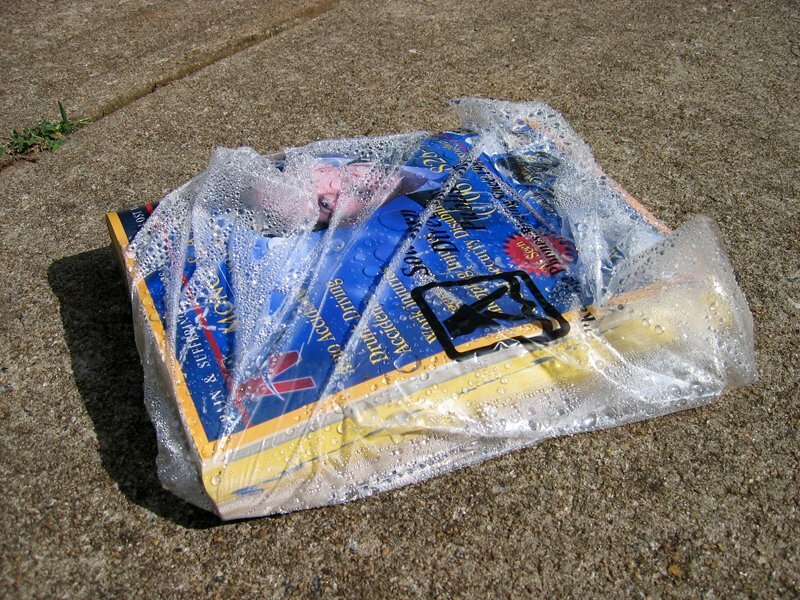 When I got home from work yesterday after a very long day, a telephone directory lay in the drive. I knew its source: three or four times a year, a pickup truck comes slowly along the street, and someone in the back tosses out a bundle at each address. But they shouldn’t at ours, because I’ve told the publishers we want to opt out. Indeed, I’ve opted out (or tried to) several times, three different ways. A few years ago the yellow pages publishers, in the face of consumer backlash, claimed they would police themselves and established a website for one-stop opt-out requests. “This is good,” I thought. It bothered me a bit to have to create an account there to use it, but I did so, and clicked all the buttons to stop the flow. I was hopeful enough to write a post on my old blog recommending the site. Well, I was the sucker born that minute. The directories kept coming. I e-mailed the contact info at opt-out service asking why, but got no answer. So I phoned customer service at the publisher of the most recent unwanted directory to express my concern. Oh, the representative said, they hadn’t heard anything from their industry association for months. She thought it was defunct. They were handling it in-house now. I observed that the front matter of their directories didn’t say so, but gave her my name and address and told her I chose to decline their product. Still another directory arrived. That time I used the opt-out link on the publisher’s website. I just did so again moments ago (it’s the last option on the “contact us” page). I’ve asked in the comments field why this keeps happening. I never get an answer. I can guess why: we’re not their customers; their advertisers are. We’re their prey. At least our municipal recycling stream accepts the books. I wish that we taxpayers could charge the directory publishers for the costs of disposal … such measures have reformed other polluters. Comments welcome … if we collected enough of them do you suppose we could build (grin) a shed? All the trays and flats, starting medium, egg cartons with shells, toilet paper tubes, and paper cups I was using got shoved under Werner von Braun to be dealt with later. I had weeds to pull! “Later” finally came today. 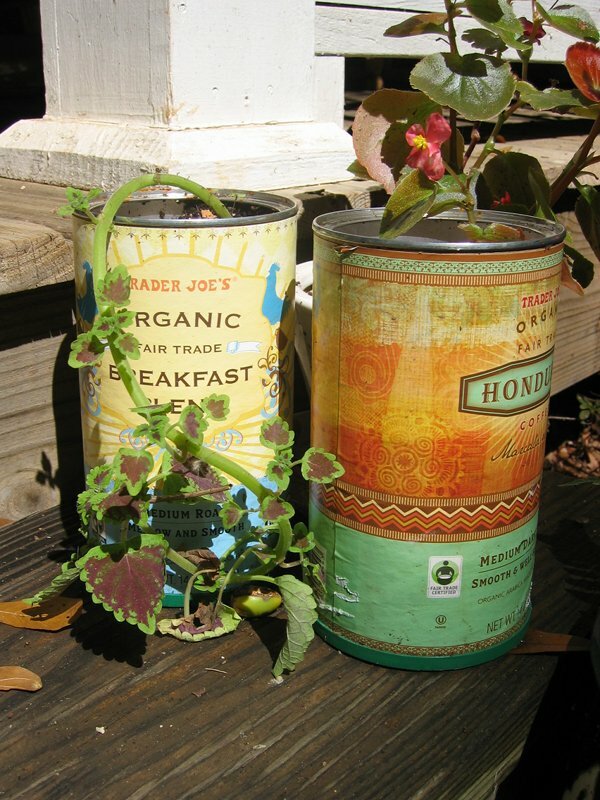 I washed the trays, composted the cartons, and filled two coffee cans with mix so I’d have a home for a begonia and a coleus sprout. It feels good to finish that project … just as I’ve sown a flat with cabbage seeds for the winter garden! 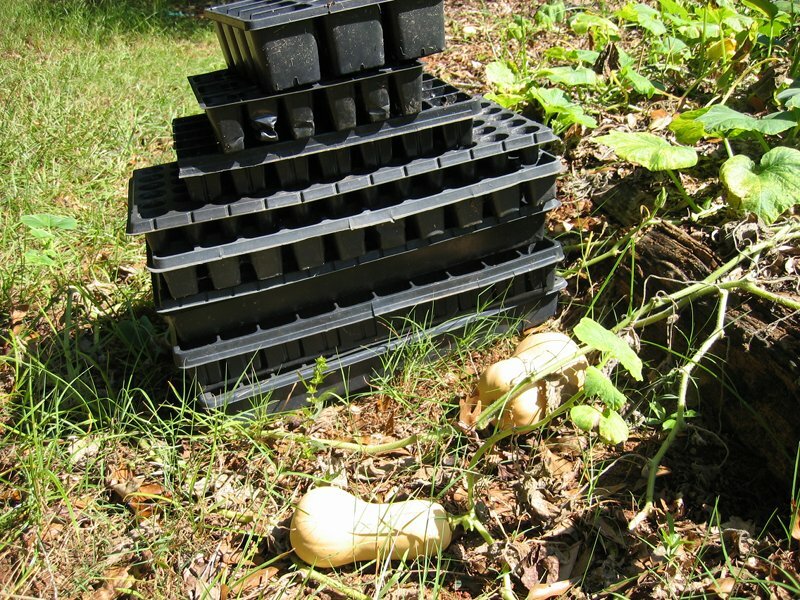 My motley collection of trays and flats pose with butternut squash. Comments welcome … do you have anything to wrap up before the next round? Sometimes I feel that if all my projects were placed in a single pile, they’d form a new peak climbers would have to bag. In fact they are largely in piles, which hinders reasonable progress toward getting them done. I mostly decide what to work on next by triage: what must be completed in order to accomplish what’s become urgent? Then I go digging. So I went to my little drawers of odds and ends of fasteners and found a round head machine screw that matched the others on the tool. Then I said to myself, “Self, that may have worked loose in the first place because washers weren’t installed under these screws and nuts.” I’m not an engineer, but I am the son of one, and I like the feeling a washer provides, that the force is spread out a little more when the tension goes on a fastener. Washers are to screws and assemblies as a couple mugs of coffee are to me and my day … it all works better if they’re there. So I fished eight washers out of a drawer and put the swing blade back together better than the day it was made. I wire-brushed the rust off the cutting edges, too. I deserve my swing blade merit badge for this evening’s work. 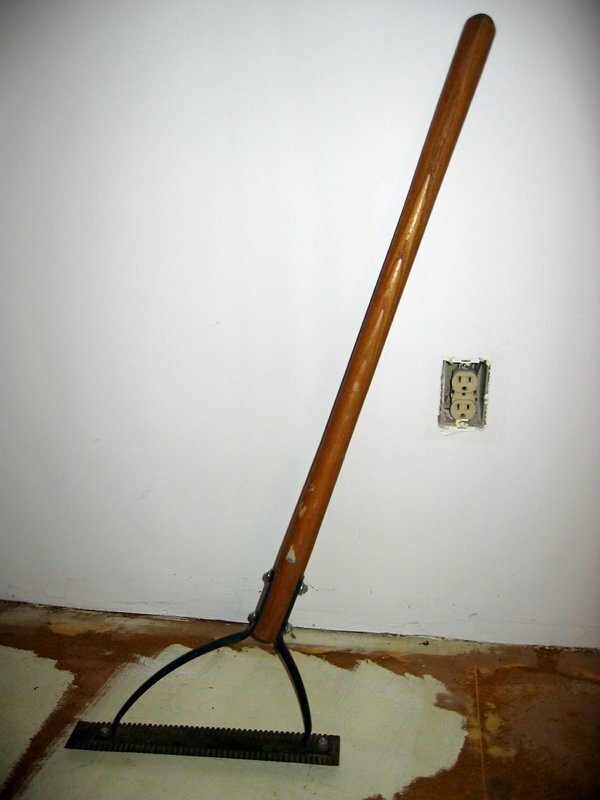 By the way, if you don’t know this tool, I’m pleased to introduce you. It isn’t as serious as a scythe or kaiser blade, but it will take down grass that’s gotten too high for the mower without wearing you out as soon as they will. And compared to a string trimmer, it has a carbon toeprint … a pinkie toe, at that. Today’s rather modest shed is of some seeds. The packet is dated for the 2009 growing season, and I don’t know how well or poorly it’s been stored. My germination test this spring wasn’t encouraging. But I’m interested in giving whichever variety it is a trial. 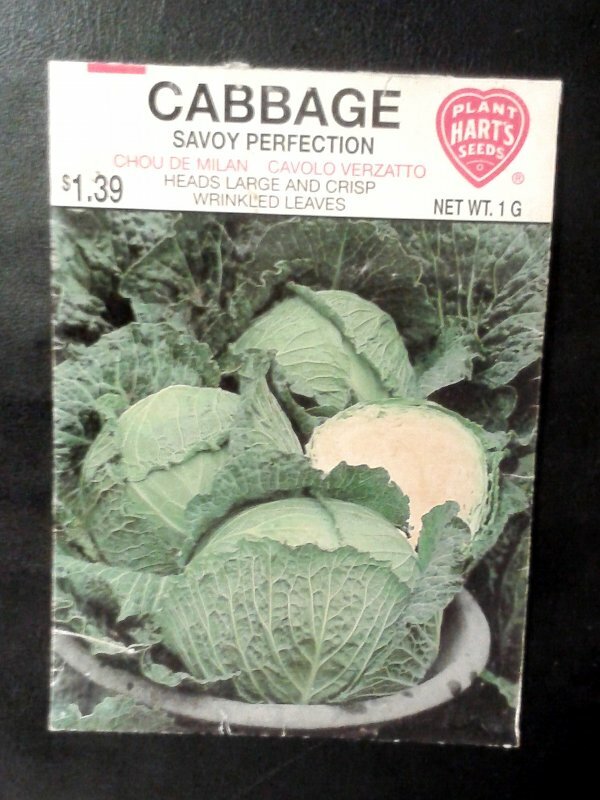 I say that because the front calls it “Savoy Perfection” and the back “Savoy Chieftain.” Both are open-pollinated, heirloom varieties with crinkled leaves and mild flavor. I sowed 66 cells in a flat with about three seeds each … if that many sprout, I’ll have to scramble to find growing space for them. One step at a time, however. I’m content that this one used up something that’s meant to be used. Comments welcome … have you anything that doesn’t improve with age you might sow in hope of a harvest? General Electric sold these, so far as I can tell, from the 1970s through the 2000s. In the later years they remembered how to spell and called them “Grow and Show” lights and Bright Sticks. But they remained much the same: a T5 lamp cemented to its mounts (which incorporated a ballast) with a cord and in-line switch. I didn’t get a picture before this shed, but, bless the internet, people collect old lighting and some of them post images at Lighting-Gallery.net. Here’s a Bright Stick quite like mine. Convenience was the primary design feature. They weighed only a few ounces and thus were easy to secure with double-sided tape. But the bulbs couldn’t be replaced. Perhaps since they were rated for 7500 hours, most buyers were comfortable with the compromise. I wouldn’t have been, but I obtained my pair of Bright Stiks by moving into a rental house where a previous occupant left them behind. I’ve used them in early spring to give tomato and other seedlings the surprising amounts of light they need to get a head start indoors. And I don’t know how many hours the lamps had burned before they came to me, but I used them up. They got blinky, and then their plugs melted. That was a bit disconcerting to observe! This afternoon, Nimue and I loaded the Bright Stiks into our bicycle baskets and rode to our county’s recycling division facility, which accepts fluorescent lamps and some other items requiring special processing. Could anyone at GE when they were designed have conceived what their end-of-life would involve forty years hence? I doubt it, but we’ve got to get better at thinking downstream. Before next spring, I’ll look into LED-lamp seed-starting solutions. Comments welcome … what have you had to do to responsibly dispose of the disposable? But the draft horses of our system are the box fans (which cost $14.95 each at the Big Box Home Improvement Warehouse). We set them in windows, blowing out, so fresh air is drawn into the house at night and during the morning before the day heats up. With four fans running on high, they provide more exchange capacity than we calculate we need—as much as a whole-house fan would. So we weren’t all that concerned when the motor in one died. The oldest have seen several seasons of use, though the product has changed so little that I can’t tell which date from 2008 and which we bought in 2013. When a second failed, I thought they might have been designed to be more consumable than I like. Now a third is slowing significantly. But the year has turned to both meteorological and astronomical autumn, and even in Georgia the nights are cooling. So I’ll get rid of the corpses and worry about replacing them next summer. 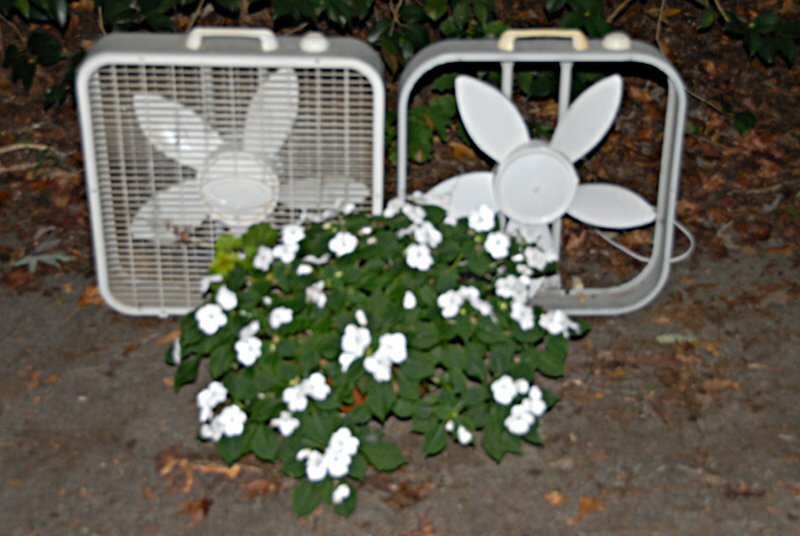 Comments welcome … are you a fan of fans? Unlike me, Nimue can play a musical instrument. She mastered the flute in her youth, and has kept the skill. But for years she hasn’t made her flute sing, because it needs service. I have a “fun fund” in the bank. What’s it for if not experiences? Comments welcome … what would you give for that with which beauty and meaning can be made? Here’s where it gets real … the instrument, the letting go. For years—make that decades—I’ve wished I could play a musical instrument. (In this, kazoos and Humanatones don’t count.) I’ve even wished I would learn to play, because I recognize it doesn’t happen by magic. But I’ve never successfully made the choice to take time away from everything else I want to do to submit to the disciplines of learning and practice. I’ve made attempts. I’ve accepted loans of guitars. I kept my friend Nancy’s piano for two years while she studied in Germany, and some evenings I picked out chords on it. But I’ve never made the commitment that might make learning to play stick. This harmonica is an artifact of one of those attempts. I recall I purchased it at the local music store in Greeneville, Tennessee one summer when I was home from college. (There was no Great Department Store in the Cloud to order things from then.) 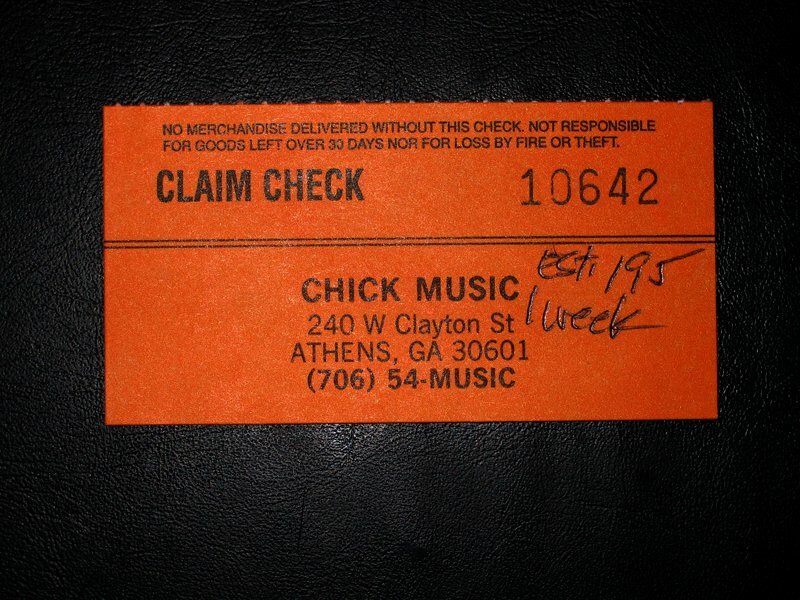 A truly decent man owned and managed the music store, and gave it his name. I’m glad I knew him. Probably I should have bought or rented a cheap guitar and asked Gene to recommend someone to give me lessons. I wasn’t that smart, then. I’m not much more, now, but I’ve become more flexible. Should I decide, somewhere and when along my path, to learn to blow a harp, I’ll buy one then—and get a teacher! 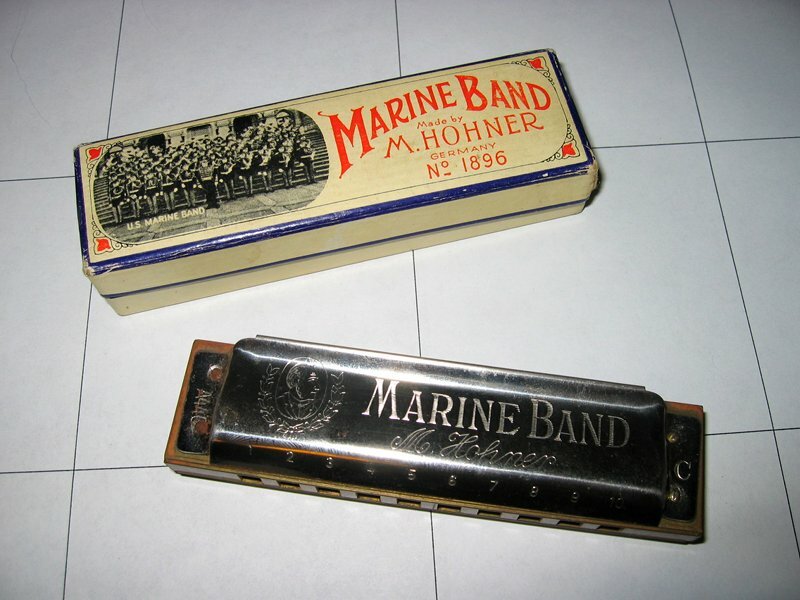 This harmonica should go to someone who’ll try to make music with it, here and now, not in a someday that never comes. Comments welcome … Julia Cameron (author of The Artist’s Way) recommends that we excavate and resuscitate our buried dreams. But I wonder, if they are a weight that clings so closely, if we’re better off dropping them behind. What do you think? It worked! I took my newly-manufactured and mastered instrument to school the next day. It didn’t raise me to the pedestal of popularity I’d imagined, but for months afterward, every now and then, my friends and I would put paper and comb together and merrily buzz though a few tunes. Later, when I was first shown a kazoo, I was unimpressed. “Why, that sounds no different than playing a comb.” A kazoo has some advantages, though. You don’t suspect you ought to wash it before you play it, or have to borrow your mother’s wax paper roll. 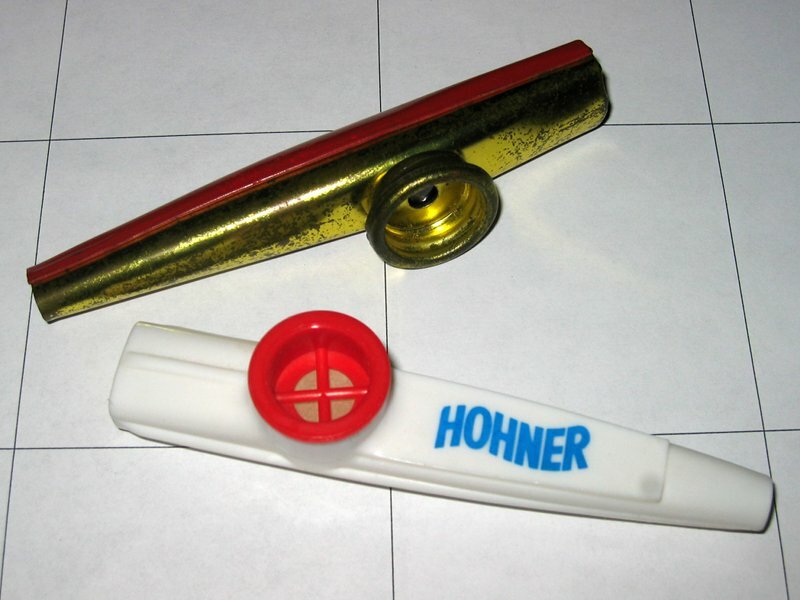 Kazoos have more cachet than combs—they’re serious musical instruments, not little boys’ homemade toys. Nevertheless, I’m going to shed mine. They aren’t much fun to play alone, and if I do, the cats take offense. They’re of the class of things best enjoyed en masse … which Leonard Bernstein knew. He scored for a chorus of kazoos in his Mass. Kazoo pop quiz: into which end do you hum?